We are learning a lot about ourselves and about each other on this trip, much of which relates to travel preferences we didn’t even realize we had. Luckily our travel preferences align when it comes to visiting temples, especially when said temples cover an area that can take up to seven days to explore! Our preference is this: let’s go for a visit, learn some of the history, take photos, walk around for a bit and call it a day! 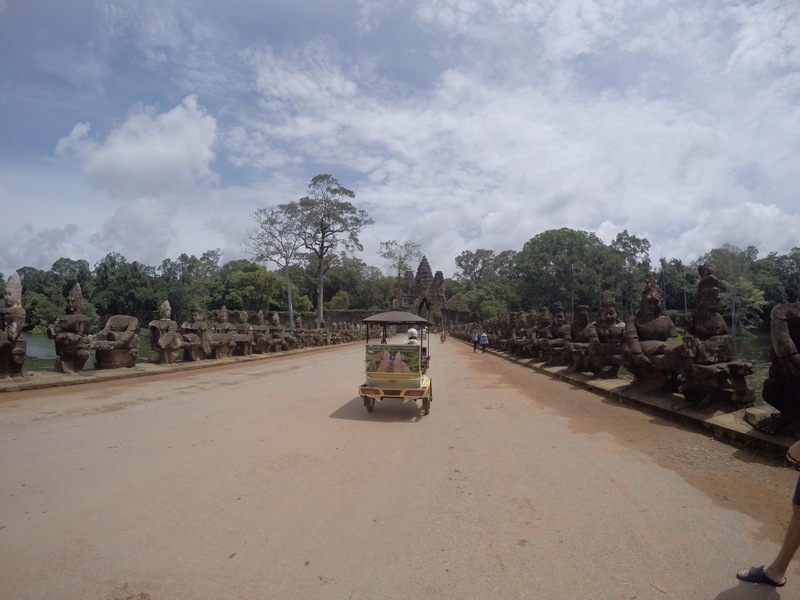 We opted for a one-day ticket to Angkor Wat and the surrounding temples for $20 per Kimble (they also sell three-day and seven-day passes), and ended up spending about five hours exploring the area by tuk-tuk. It was the perfect amount of time for us. In five hours we were able to see many of the main temples but did not feel completely burned out (both literally and figuratively) by the end of the trip. Our guesthouse had arranged a free tuk-tuk ride from the airport on the day we arrived, and this same tuk-tuk driver agreed to take us around Angkor Wat on the next day. We debated between this option and renting bikes to explore the area but are so glad we had the tuk-tuk at our disposal, providing shade for us when we needed a break from the sun and providing protection from the rain during sporadic downpours! Our driver took us from temple to temple and was always waiting for us with a smile. 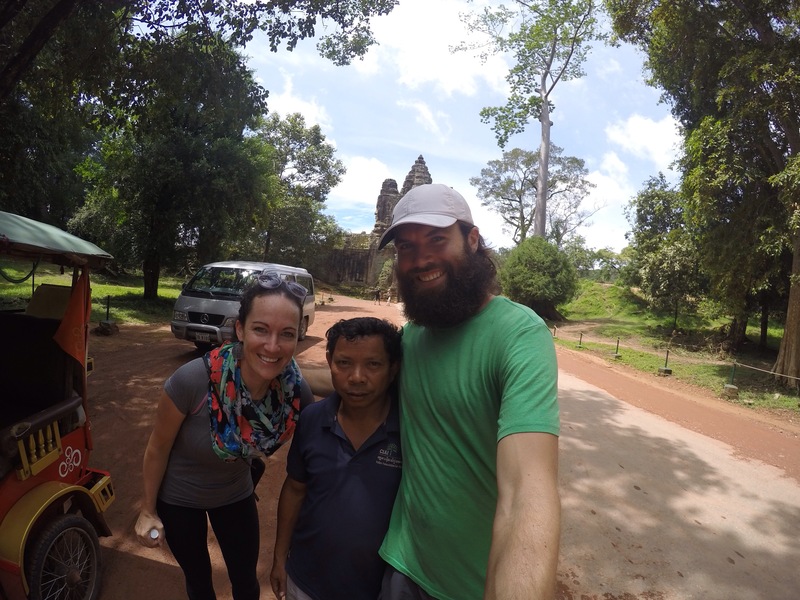 The best (and possibly shortest) tuk-tuk driver in Siem Reap. The interesting thing about Angkor Wat is that in some senses it is a misnomer. Angkor Wat is a beautiful temple complex built within the former Khmer capital city of Angkor Thom. 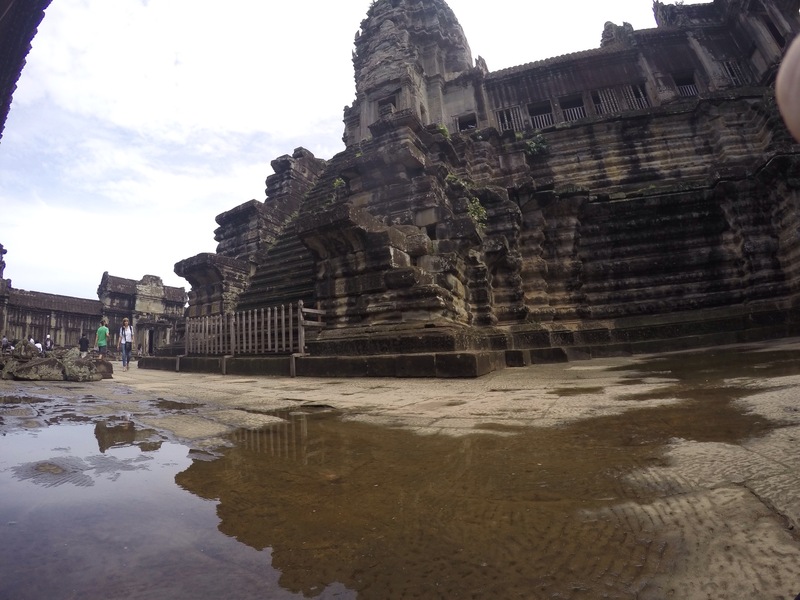 The entire site includes a vast array of temples and ruins, of which Angkor Wat is just a portion. In comparison to the whole, that portion is relatively “small.” But in itself, Angkor Wat is the largest religious monument in the world! It originally began as a Hindu temple and was gradually converted to Buddhism. It’s also a wonder of the world, and deservedly so. Angkor Wat’s literal translation is “city of Temples,” which is fitting due to the complexity (pun intended) of its design. As was the case with other classical temples built by the Khmer people, the design is created so that the walls enclose the complex, with the main sanctuary situated in the middle. This was representative of Mount Meru, a sacred mountain of the gods in Hindu and Buddhist teachings. 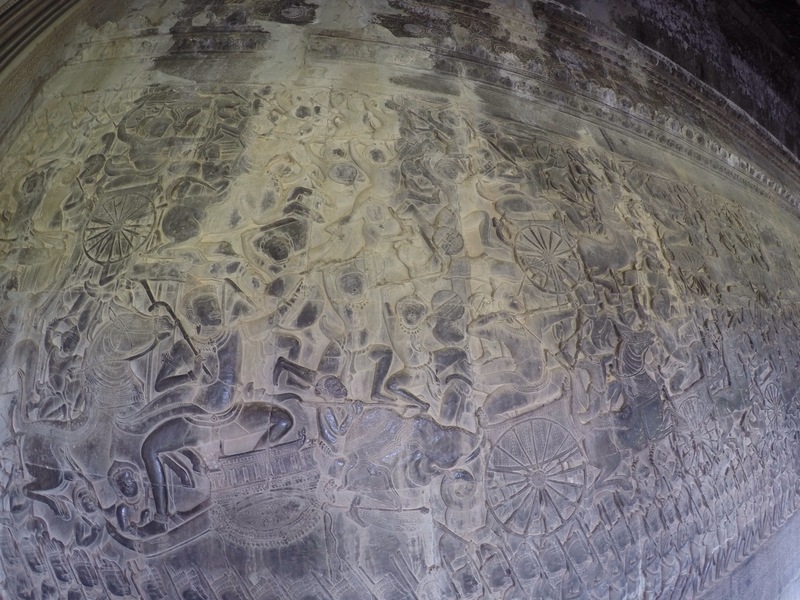 The walls of nearly every corner of Angkor Wat are covered with “devatas,” a Hindu term for deities. The detail was simply astounding! The historical significance of this religious site has become so symbolic in Cambodia that it is represented on their flag. Pretty cool! Though we could go on writing about Angkor Wat all day, there were many more interesting sites we visited in Angkor Thom. 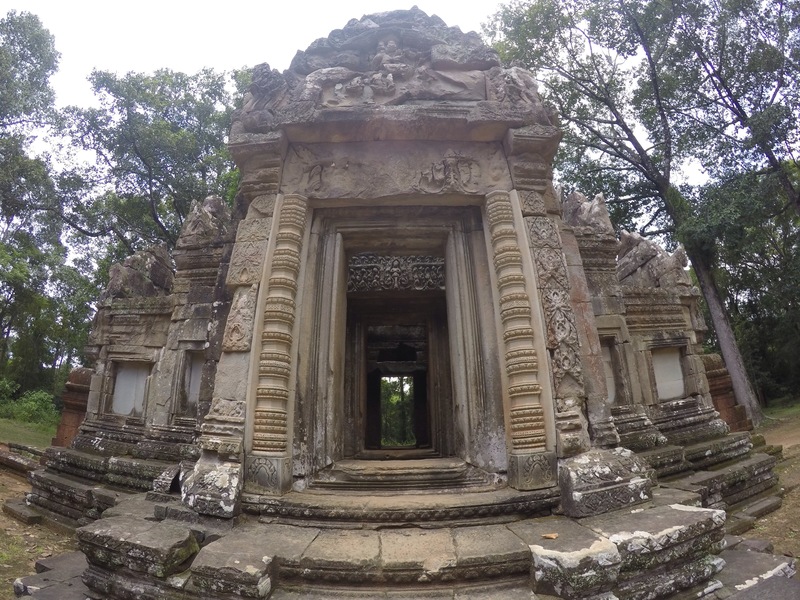 Two more that stood out in our experience were Prasat Bayon and the Ta Prohm temple. 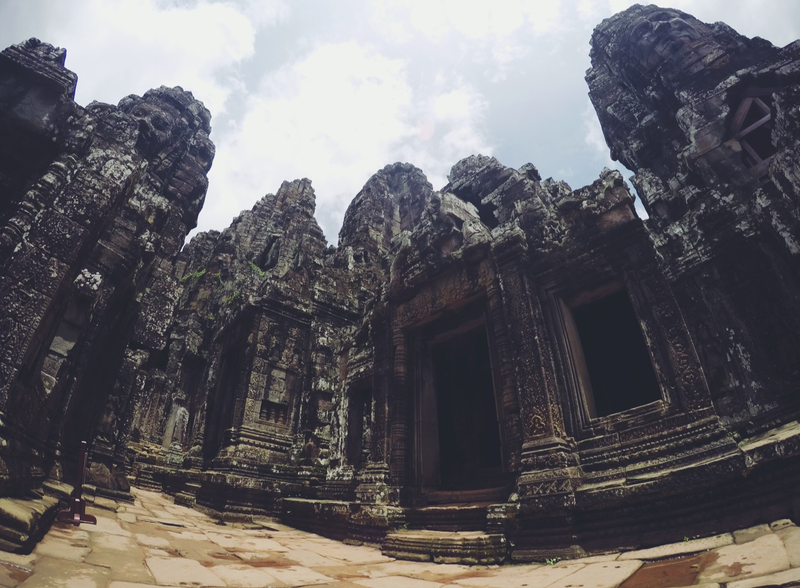 Standing in the exact center of the city of Angkor Thom, this impressive temple has 2,000 large faces carved onto its’ 54 towers! This MUST be where the many-faced god dwells (shout out to all you Game of Thrones fans). Seriously though, this place is amazing! You can’t help but feel like you are personally discovering this temple for the first time in history, as it is tucked away deep in the jungle. It definitely evokes a strange and slightly eerie feeling, with 4,000 eyes constantly watching from high above. 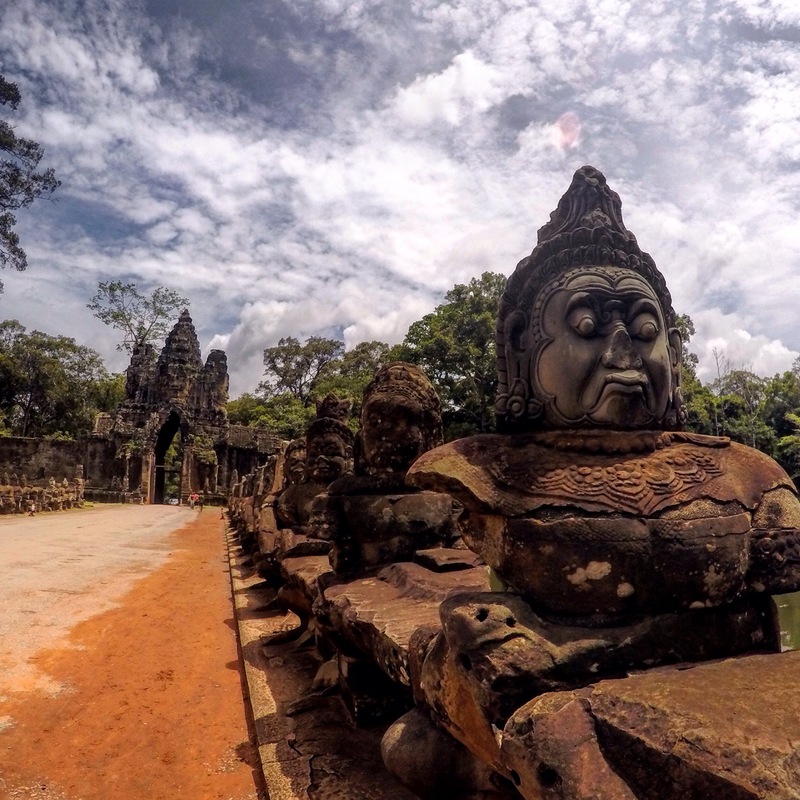 “We are watching you,” say the faces of Prasat Bayon. Good luck having a staring contest here. These guys can go on for ages! If you’re one of the many who have watched Angelina Jolie in Lara Croft: Tomb Raider, then you’ve already seen parts of this unique temple! 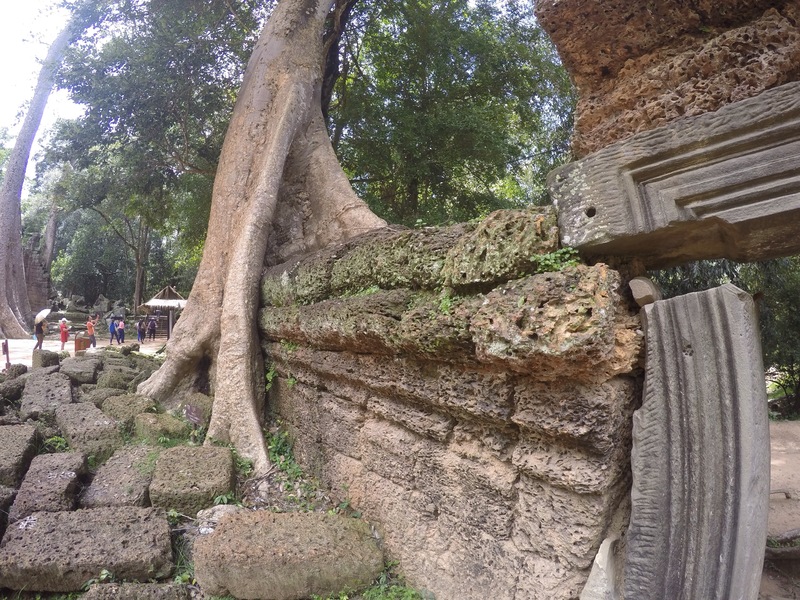 Ta Prohm is a tourist favorite, and rightfully so. 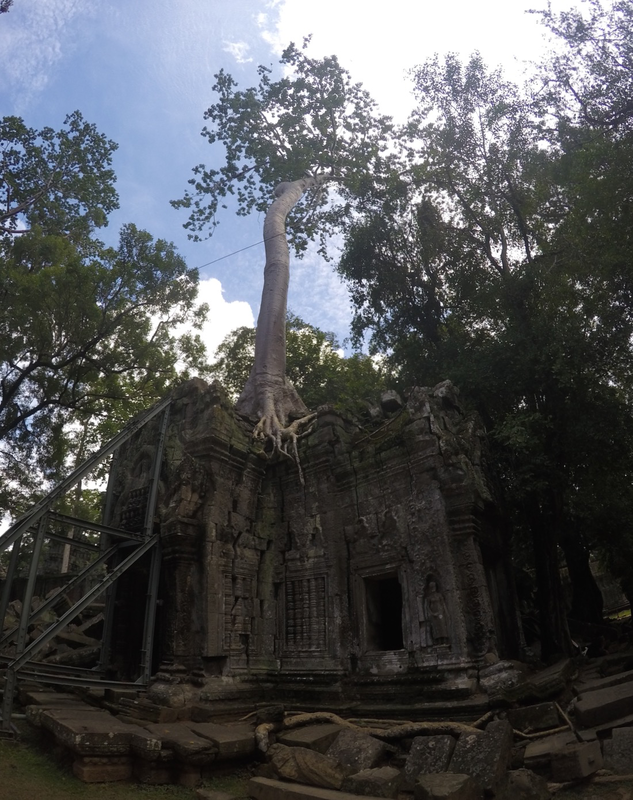 It offers something very different from most of the other temples: a glimpse into the power and beauty of our Earth as the jungle attempts to reclaim its land! 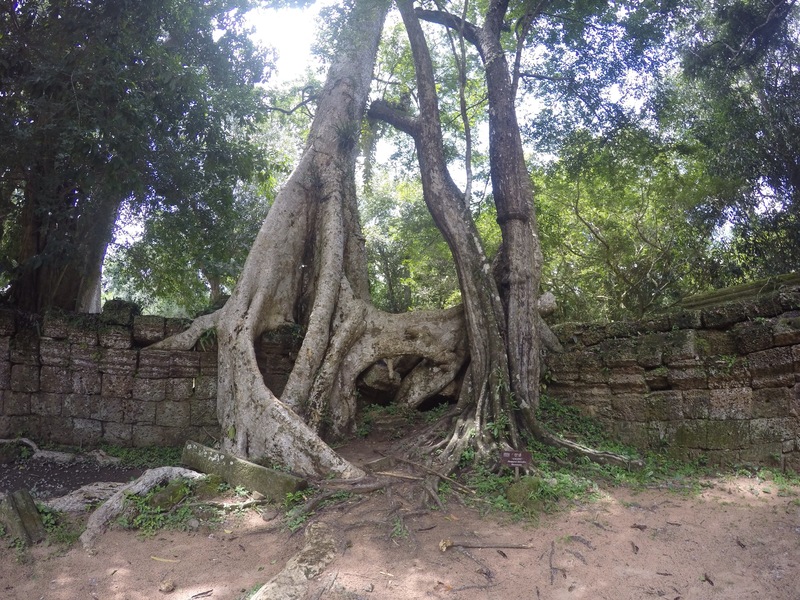 Unlike most other Angkor temples, Ta Prohm has been left almost exactly as it was found many years ago. Similar to Prasat Bayon (and probably more so), the decision to leave the structure primarily “as is” provides the visitor with the opportunity to feel the intrigue and mystery that the explorers must have felt when rediscovering this architectural masterpiece. The huge trees which both crush the stone and simultaneously support it are truly a sight to behold. Check out our YouTube video recapping our visit. 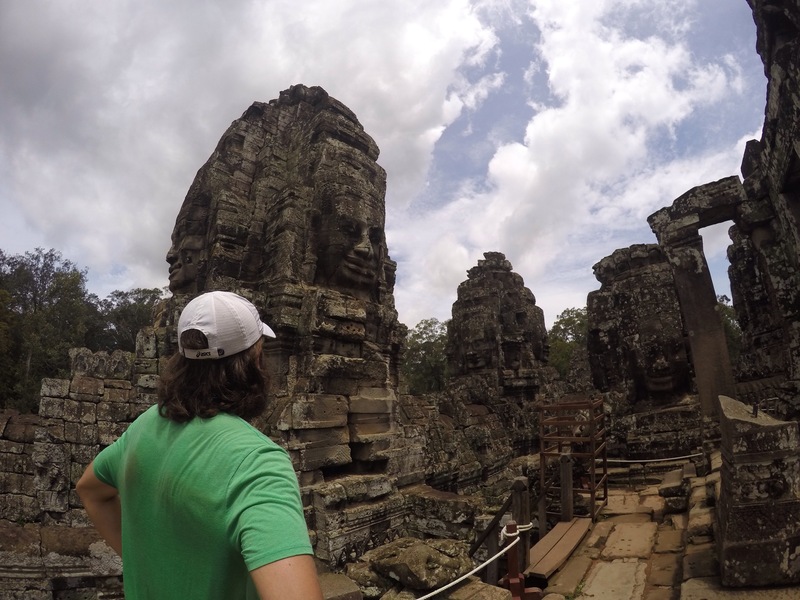 We hope the footage helps bring Angkor Wat to life for you! Tickets for two with complimentary mugshot. Wall carvings at Angkor Wat. Adam, Your link appears to be broken. 😦 Love reading about your adventures! Thanks Sheila! Not sure what caused the problem. Hope you and your family are doing well!! Just saying hi and we’re still following as much as we can! Love you guys! Baby sends a high five.